Come and sew along with me!! 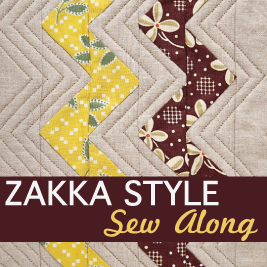 Lindsey of LR Stitched and Amy of Don't you Know Who I Am have put together a really great sew along based on the book Zakka Style by Rashida Coleman-Hale. This book is full of fun, small projects to sew for you and your home. Some of my favorites are the zig zag tote, patchwork pot holders and the zakka pincushion. They have gathered 24 bloggers to sew through all of the projects in the book and you are invited to sew along with us! Come on over and join the flickr group. There will be lots of sharing, tips, inspiration and prizes. It doesn't start until April 2nd so you have time to get the book if you don't already have it. I bought mine through Amazon and Rashida has signed copies on her site. I'll see you on May 7th with my version of Itty Bitty Quilt Block Magnets! I have loved these since Nova first posted them and now I get to learn how to make my own... and maybe a couple for gifts. Yay! The sew along starts Monday April 2nd with the first project in the book and will continue through Monday September 10th with a new project introduced each Monday. Each blogger will sew a different project and will be sharing their finished project and inspiration with you. There will be some lovely prizes offered each week and we are so thankful to have the support of Stash Books, Aurifil, Zipit, Robert Kaufman and Timeless Treasures. Oooh I'm excited! This is gonna be awesome! Love it! Count me in! And no, it's not just an excuse to buy the book (although it DOES give me good reason, hehe! ).